I went to the park today to photograph some baby quilts. I talked about using appropriate props in this post and aimed to do that. Things don’t always work out the way you think they will. The playground was crowded and I wasn’t going to ask all the kids having fun to get out of my frame. So I took the quilts back home and looked around my yard for other options. My fence is actually a pretty good backdrop. I pinned a string of fabric on the back of each quilt for hanging. The strings loop around two nails on top of the fence where we hung Christmas lights last year. I like the natural look of the wood and the contrast it adds. Here’s the front side of the above quilt. 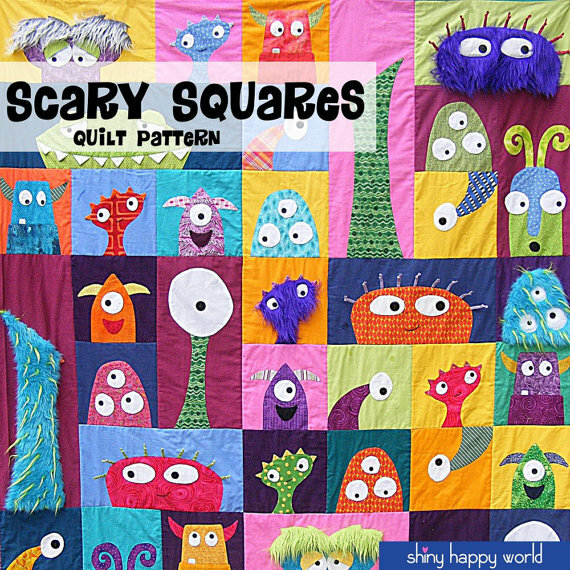 How cool is it that this crumb-pieced baby quilt is double sided?! 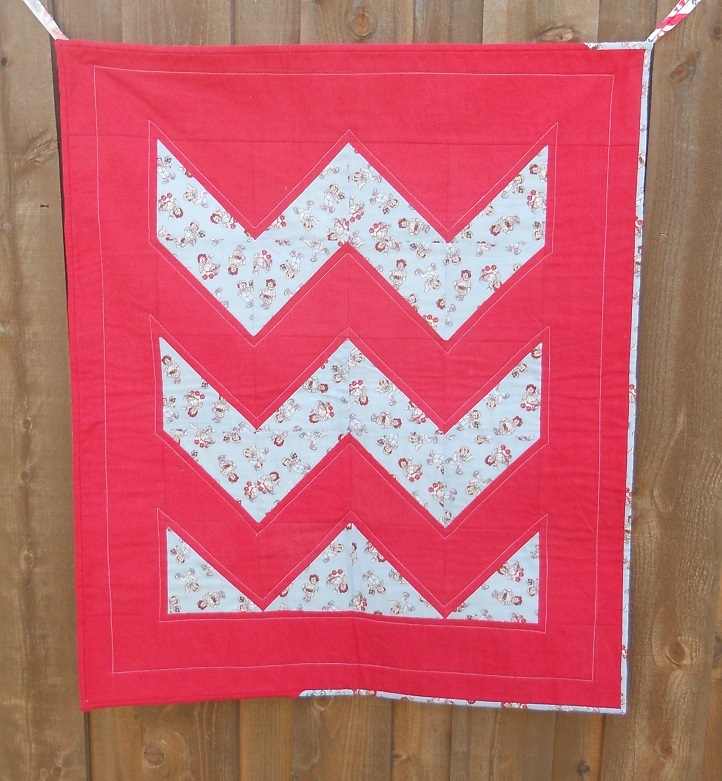 The front has crumb blocks pieced into black, white, and red fabrics. The back has crumb blocks appliqued onto a green, red, and white floral. Here’s a Raggedy Ann and Overall Andy quilt. I paired this sweet fabric with a solid red to merge modern and traditional. The chevron zig-zag looks a bit like a crown too. This one is a simple floral patchwork. I’m working on two more baby quilts. (And I have several more in mind that haven’t yet been started!) One is for this week’s Project Quilting challenge. It uses only 5″ charm squares of fabric. I’ll be cutting them up and piecing ’em back together. Here’s the first cut. I have one week to finish and enter it. Quilts and more are for sale in my etsy shop! Here’s a sampling of other baby-sized ones that are ready today. Want something specific you don’t see here? I specialize in custom orders. Let’s talk. Linking up to Oh Scrap! This entry was posted in Artist's Studio, Challenges, Crumb Quilting, The Business and tagged baby quilts, challenge, change of plans, charm packs, charm square quilt, chevron quilt, crumb pieced, crumb piecing, crumb quilting, crumbs, double-sided quilt, etsy shop, fence backdrop, floral baby quilt, floral patchwork, kids quilts, new for sale, Oh Scrap!, overall andy, photographing quilts, playground photography, project quilting, quilt, quilting, quilts for sale, raggedy ann, red white black, scrappy quilt on March 15, 2015 by quiltartbymegan.